Excerpted from Gentle Birth, Gentle Mothering 2oo5. 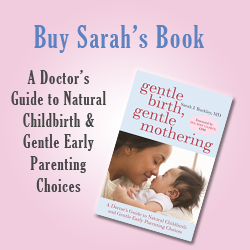 An updated (2009) version of this article is published as Chapter 8: “Leaving Well Enough Alone” Natural Perspectives on the Third Stage of Labor” in Gentle Birth, Gentle Mothering: A Doctor’s Guide to Natural Childbirth and Gentle Early Parenting Choices (Sarah J Buckley, Celestial Arts, 2009). The first oxytocic to be used medically was egot, derived from a fungal infection of rye. Ergot was known to to be used by 17th and 18th century European midwives. Its use was limited, however, by its toxicity. It was refined and revived as ergometrine in the 1930’s, and by the late 1940’s, some doctors were using it as a preventatively, as well as therapeutically, for post partum haemorrhage.21 Potential side effects from ergot derivatives include a rise in blood pressure, nausea, vomiting, headache, palpitations, cerebral haemorrhage, cardiac arrest, convulsion and even death. Third stage represents a first meeting, creating a powerful imprint upon the relationship between mother and baby. When both are undrugged and quiet, fully present and alert, new potentials are invoked, and we discover more about ourselves, and the sacred–and biological–origins of our capacity to love. For the whole story on cord clamping and the magical hour after birth, see Dr Buckley’s webinars “The Magical Hour After Birth ” and “The Cord Blood Banking Decision” available to GentleNaturalBirth professional members.